I love plums. I really do. Sometimes I have a hard time doing anything with them other than just popping them in my mouth. 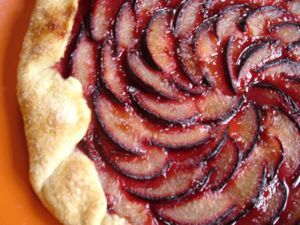 With the last gasp of summer stone fruit upon us it’s time to do a little simple baking. I’m not much of a baker really, and I prefer uncomplicated fruit desserts. This is my go-to dessert all summer long. When I’m asked to bring a dessert to an event, this is it. I’ll use peaches, apricots, plums, cherries, nectarines, or even a combination. The cornmeal crust is easy to work with and holds up well to the juicy fruit. It also adds a nice crunch to the final product. Try it with apples or pears in a few weeks. Though I’d add some sweet spices to the fruit. The secret to a flaky crust is to keep the ingredients as cold as possible and don’t over mix the dough. Stir together yogurt and water and keep in the freezer while you mix the other ingredients. Mix together flour, cornmeal, sugar, and salt. Add butter and work in quickly with a pastry blender, leaving some pieces of butter the size of small peas. Sprinkle the ice water/yogurt mixture over the flour-butter mixture gradually, mixing it in with a fork. Be careful not to over mix. The dough can still be crumbly, but should stick together when pinched. You may not need to use all the yogurt-water mixture. Gather the dough into a ball, wrap and refrigerate for two hours. Roll out dough to a quarter inch thickness and transfer to a baking sheet. 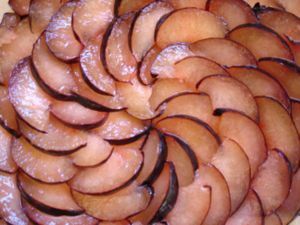 Top the dough with sliced fruit, working in a spiral from the inside out, leaving a border of about 2 inches all along the edge of the dough. Fold the edges of the dough inward to encase the fruit, and sprinkle with sugar. Bake at 400 degrees until the crust is brown and flaky and the fruit soft, bubbling and fragrant, about 15 to 20 minutes. This entry was posted in dessert, from the market, fruit. Bookmark the permalink. Post a comment or leave a trackback: Trackback URL.